Allergy Advice: Contains Wheat, Egg, Soy, Milk. Manufactured on an equipment that processes products containing peanuts. Ingredients: Wheat Flour, Egg, White Sugar, Shortening (E471, E475, E494), Malt Syrup, White Granulated Sugar, Humectant (E420, E422), Vegetable Oil (Palm Oil, Soybean Oil), Water, Emulsifiers (E471, E1520, E491, E473, E477, E475, E322), Edible Alcohol, Whole Milk Powder, Egg Yolk Powder, Leavening Agents (E341(i), E500(ii), E336), Flavour, Edible Salt, Colour (E160a(i)), Brandy, Thickening Agent (E415). 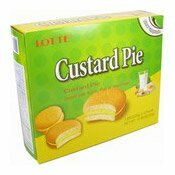 Simply enter your details below and we will send you an e-mail when “Custard Pie (樂天蛋黃批)” is back in stock!